On Saturday mornings from May to November the Portland Farmer's Market takes place at Deering Park in the center of Portland, Maine. It is a beautiful setting for people to meander among plants, organic meats, fresh cheeses, vegetables and crafts. This Memorial Day weekend offered more herbs to plant than veggies to purchase, but there was still a lovely assortment. 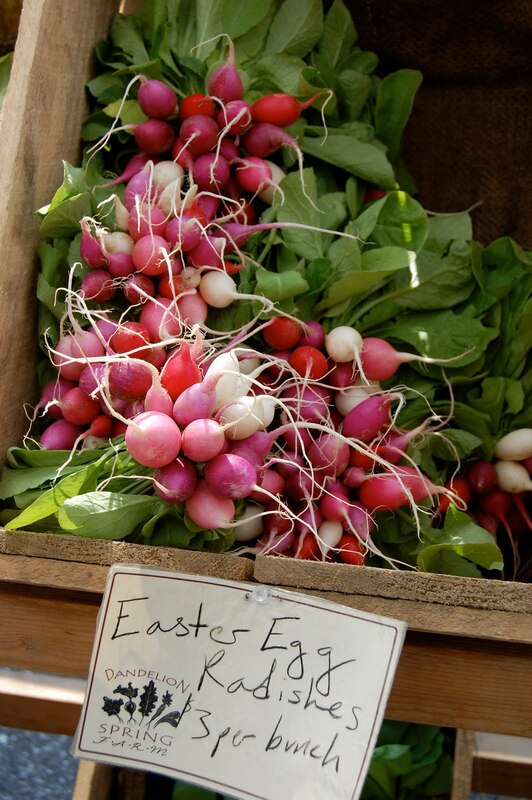 I saw radishes in all shades, fresh sprouts, a variety of greens and fresh turnips. Farmers assured me that the height of the produce is in late summer and early fall. I promise to return then if this is just a hint of what they have to offer. But for now there was still fresh yogurt, pork, chicken and local honey. Portland Farmer's Market: Saturdays at Deering Park, 7-12 and Wednesdays at Monument Square from 7 to 2.